Coppercoat is the world’s only water-based and VOC-free antifoul on the market, this copper-rich epoxy system is designed to repel marine fouling in all waters and commonly remains effective for at least ten years. For long distance ocean racing, a clean hull is of paramount importance. By the midway point in previous races, the entire Clipper Race fleet required lifting so the tired antifoul paint could be replaced with fresh product. But using Coppercoat has eliminated the need for this work and expense. “Knowing that Coppercoat could help the fleet to sail around the world more efficiently, it become clear that this was an event we should support,” explains Ewan Clark, Coppercoat Director. “When developing Coppercoat, we set out to produce the most hard wearing and long lasting coating available. For us, an antifoul is about endurance as well as performance. These are just some of the qualities required by Clipper Race crew; ordinary people with a desire to show they can perform at a high level for extended periods whilst simultaneously enduring everything the ocean can throw at them. 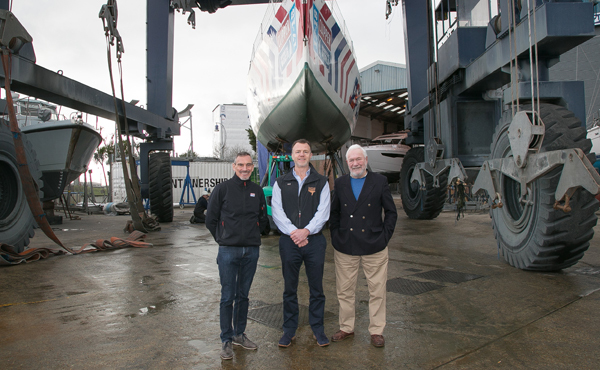 Image: (L-R) Clipper Race CEO William Ward OBE, Coppercoat Director Jayson Kenny, Clipper Race Chairman and Founder Sir Robin Knox-Johnston celebrate announcement of two-race partnership. “The Clipper Round the World Yacht Race is one of the best-known events in sailing, and one of very few with true global reach. Being a global business ourselves, it provides us with the perfect opportunity to showcase our product in existing, emerging, and indeed new market places. Click here to learn more on Coppercoat.